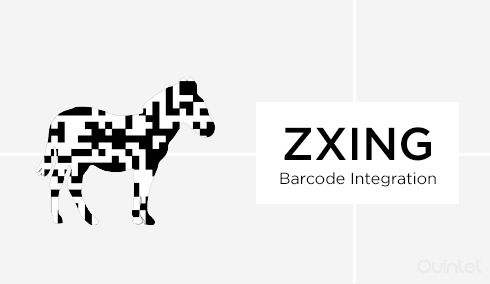 ZXing or Zebra crossing is a barcode image processing open-source library implemented in Java which enables multi-format, 1D & 2D barcode processing. The library also provides additional support with ports(to other languages). It could scan and parse both QR codes and barcodes. It uses the built-in camera on mobile phones to scan and decode barcodes on the device, without communicating with a server. ZXing library supports formats such as QR Code, UPC-A & UPC-E, Data Matrix, EAN-8 and EAN-13, Codabar, Code 39, Code 93, Code 128, most variants of RSS Expanded, ITF, all variants of RSS-14, PDF 417 (‘alpha’ quality) and Aztec (‘beta’ quality). Along with the support to decode barcodes, it also support barcode generation. Our expert team make sure the scanner looks simple and easy to use. We provide customization on renderer property of the scanner by changing the appearance of the barcode, such as the background and foreground colors, font size, weight and make it look as a part of the application. We can integrate barcode and QR Code scanning directly into your application without relying on having the separate ZXing application installed. We could easily integrate ZXing library which could read information like url’s, contact details etc in QR codes, Data Matrix, barcodes printed on products etc. Among the competitors, ZXing differs in its open-source nature and multi-format image processing functionality. The support package provide a scanner application in order to support the image scanning using the library. Our team is good at using the various modules provided in order to support different platforms. In Mobile application perspective, ZXing support is available for both Android and iPhone application development and the library offers better recognition accuracy in reading images. ZXing Barcodes are often overlooked as a method for cutting costs and saving time. A valuable and viable choice for businesses looking to improve efficiency and reduce overhead. It takes only seconds to use the hand-held scanner for reading barcodes. Furthermore, employees do not have to gain familiarity with an entire inventory or pricing procedure. The occurrence of errors for manually entered data is significantly much higher than that of barcodes. A barcode scan is fast and reliable, and takes infinitely less time than entering data by hand. More the time you save, more your business grow. It takes only seconds to use the hand-held scanner for reading barcodes. Furthermore, employees do not have to gain familiarity with an entire inventory or pricing procedure. This also makes employee training less expensive and thus we help you use the resources better. Inventory control improves drastically because ZXing barcodes make it possible to track inventory so precisely, inventory levels can be reduced. The location of equipment can also be tracked, reducing the time spent searching for it. Since the information is scanned directly into the central computer, it is ready almost instantly. This quick turnaround ensures that time will not be wasted on data entry or retrieval. We design perfect interfaces for getting these data displayed. Google Maps is a web mapping service provided by Google. Maps are embedded on third-party websites via the Google Maps API. At Quintet our developers have expertise on integrating google maps on web applications as well as iOS/Android applications. Apple has introduced a new payment method for its users – Apple pay, which is a secure and easy way to buy, physical and digital goods and services using your iPhone 6 and iPhone 6 Plus. Quintet can help you integrate Apple pay to your existing iOS Apps or the new one you are planning to develop. Google Analytics is a service offered by Google which generates in depth statistics about any website's traffic and its sources. By analyzing the website traffic we paint a complete picture of your audiences and their area of interests in your products or services helping you differentiate between just visitors and prospective customers.